This is the last time i'm going to make this - much as i like peppers, the pain of removing all that skin is not worth it! 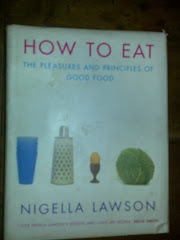 This is just yellow and red peppers as Nigella never uses green peppers in anything and tara agrees with her apparently. - Chargrill 4 red and 4 yellow peppers under the grill until slightly blackened. - Peel them over a bowl to catch the pepper juice. (Alex said putting them in bag to steam first helps get the skin off). 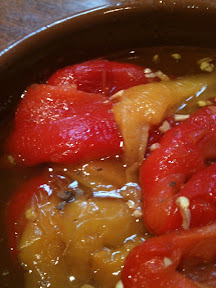 - Cut the peppers into strips and put in a shallow bowl. - In a pan, heat 5 tablespoons olive oil and add 2 cloves minced garlic. - After 1-2 mins, add 3 finely chopped anchovy fillets heating until they've melted into the oil. - Take off the heat, add juice 1/2 lemon and pour over the peppers. - Leave to macerate in the fridge until ready to eat. - Should be enough for about 6 people.